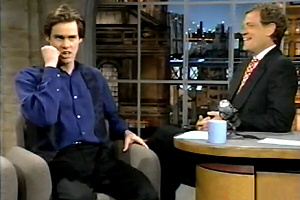 In 1994, Jim Carrey did an interview with David Letterman on 'The Late Show with David Letterman' to promote his new movie "Dumb and Dumber". At the beginning of the interview, David Letterman introduced Jim as the "biggest star on the planet." After settling down on the couch, Jim commented about the paparazzi outside that they take your picture as if they wanna put it on blueboy. Also, their behaviour changes so rapidly. At first, they will say "Jim! Come on! Give me a smile!" And then "COME ON! Tom Hanks let us take 3 rolls man! Cruise stands here all night if we wanted him to! Schwarzenegger let us draw him!" Later on, Jim also explained about the phone calls he gets all day about good movie deals. Carrey joked that in order to relax he has started racing Formula Ones and had an accident which cracked his skull, spines and leg and still he cant wait to get back out there. Then, Jim amused everyone by pointing at his face saying "This isn't even my face." Then, he made a horrible face saying "Thats my real face. I hope my real fans would stick with me." After that, he showed 'Monitor Madness" with his facial expressions. David Letterman asked him about his "Dumb and Dumber" co-star Jeff Daniels. Jim said while making a face-"Yeah he is all right." Jim said that he thinks the movie "Dumb and Dumber" is more of a departure film for him. The men in this movie are lovers! A clip from the movie showed a 'fantasy sequence' where he has a fight with a Chinese chef. When David asked how did the two guys in the movie meet, Jim said "Ok I didn't do any research! They just happen to know each other!" In the end Jim announced that this movie is going to be "the greatest movie ever." -- Source: YouTube. Click to comment this article.